At the end of May, housebuilder Crest Nicolson submitted detailed plans for the development of 137 homes (18/02413/REM). This stage is known as reserved matters, the outline plans having been controversially approved at appeal in November 2016. After Shropshire Council refused to challenge the appeal decision in the high court, the focus has moved to ensuring that the scheme is as good as it can be. That’s down to Shropshire Council’s planners and Viv Parry, occasionally supported by myself. The development is to be called St Laurence View. It was all going well. Changes have been agreed on landscaping and pedestrian access. But among many technical revisions submitted in mid-September were changes to the plans for access to the A49. All T-junctions onto major roads need to be splayed. 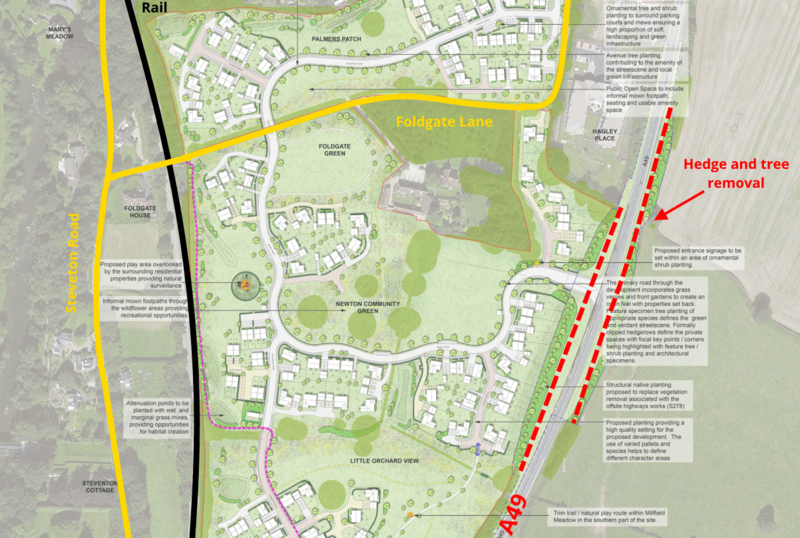 The splay now proposed for this scheme involves felling and partly removing more than 450 metres of hedgerow and trees on both sides of the A49. 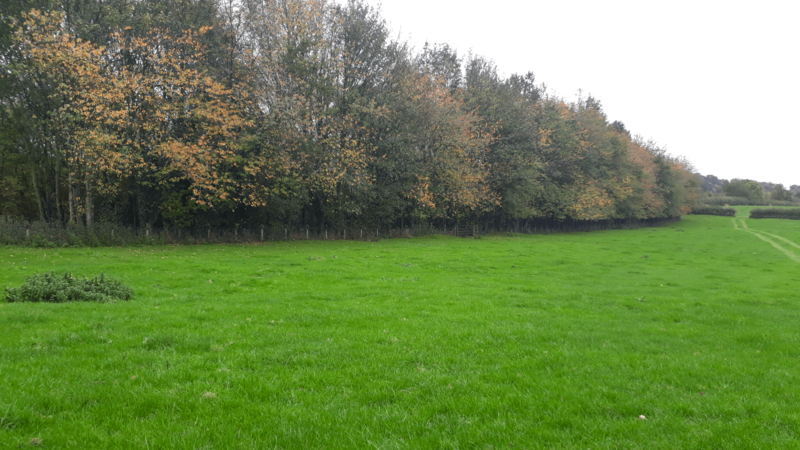 The hedgerows are described by the developer’s arboricultural consultants as a “typical woodland buffer strip” that is “densely planted with mix of fast-growing species”. They contain young mature and semi-mature trees up to 19 metres high with trunk diameters up to 650mm. Although there are “occasional failed specimens”, the trees form “cohesive canopies”. The species are ash, beech, cherry, English oak, hawthorn, scots pine and sycamore. The consultants conclude the trees are “moderate quality due to collective screening value” and “low individual significance”. Shropshire Council’s Tree Service is very unhappy with this loss. The service says it had commented on the outline planning application in 2015 on the understanding that there would only be a small breach of the tree buffer to gain access to the A49. What’s more, the current replanting plans could be overturned by Highways England. Officers are concerned that the replacement planting could also eventually encroach on properties and be felled. The tree officers say that the proposals are a material change to the outline planning application. Planning officers seem not so sure and have asked the developer for more information. They want a photomontage of the access from the A49 under both the original proposal and under the new proposals. Could mitigation be in place from the outset using willow, hazel and shrubs? Can’t more trees to the south of the proposed access have their lower boughs pruned rather than being felled? Planning rules in the National Planning Policy Framework say that felling trees is the least desirable option. Despite the diplomatic exchanges between officers and with the developer’s agents, there is quite a conflict here. It won’t lead to the housing scheme being scrapped but it could delay it a while. 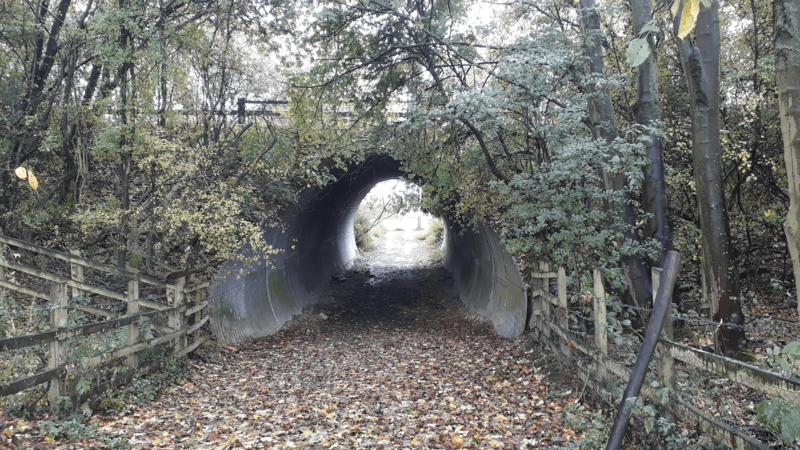 Highways England says that it does not have enough information to approve infilling of the underpass. It has imposed a three-month block on approval of planning permission. I am sure the block will be removed once the paperwork has been exchanged. With these new developments, I would be surprised if full planning permission is given this side of Christmas. Councillor Viv Parry has requested that this stage of the planning application is considered by the South Planning Committee. Previous Post Parking enforcement loses £10 a ticket in Shropshire. Parking money mostly goes to buses. Did you know that? Apart from the considerations you mention, there is the effect that hedgerow and trees have in shielding nearby residents from the traffic noise of a main road. Only a consultant could estimate how far away this loss of noise abatement would be felt, so it might perhaps be wise to seek advice on this point while the scheme is at an early stage. Is there planning for a slip lane for traffic turning into the estate from the north? Or is another possibility to put a roundabout in? Traffic drives so quickly up from the Ashford turn, but the long bend after the railway bridge would always be a worry – hopefully we wouldn’t have to wait for serious accidents before a proper solution is found. There will be a “ghost island”, a slip lane in other terms. Even then, I don’t think on a misty autumn morning it will be a safe junction. Nor me – unfortunately seems more like a “disaster waiting to happen” – just the same as at Woofferton!